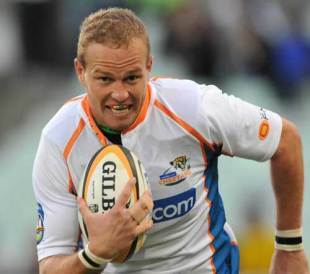 The Sharks have continued to build towards the opening season of Super 15 rugby with the signing of Cheetahs centre Meyer Bosman. Bosman, 25, has won three caps for South Africa and will arrive in Durban upon the completion of the Currie Cup season. He joins Bulls fly-half Jacques Louis-Potgieter in signing up, giving the Sharks some much-needed strength-in-depth in midfield. Their fragility has been highlighted this week with injuries to Steve Meyer and Ruan Pienaar, with youngster Patrick Lambie set to fill the void at No.10 this weekend when they take on the Lions. Pienaar will leave Kings Park for Ulster in September. Meanwhile, there is better news for the Cheetahs as youngsters Robert and Sias Ebersohn and Coenie Oosthuizen have signed new one-year deals to remain with the province.